When you’re given the opportunity to head off to sunnier climes for an afternoon’s pedalling with the current king of the cobbled classics and this year’s hot favourite for the Tour, there’s not that much arm twisting required. To top it all, Trek had even managed to arrange for warm, sunny weather in Majorca (something that is by no means a given in January), while my colleagues back in Croydon were being treated to some good old UK cold wind and rain. It was always going to be a bit of a media scrum, with Cancellara and the Schleck brothers both attracting a lot of attention, plus the hype surrounding the launch of a brand new team, which is claiming boldly to be the number one cycling team in the world. But Trek does seem to thrive on the adrenaline of allying itself with teams with high expectations. Right now though, we were constantly reminded how young this team actually is. The team Madone 6.9SSL bikes were not the finished article, more like mock-ups for the training camp, as final details had only been approved some four weeks earlier. Team cars were still being stickered up in the basement and the mechanics’ overalls were barely soiled. 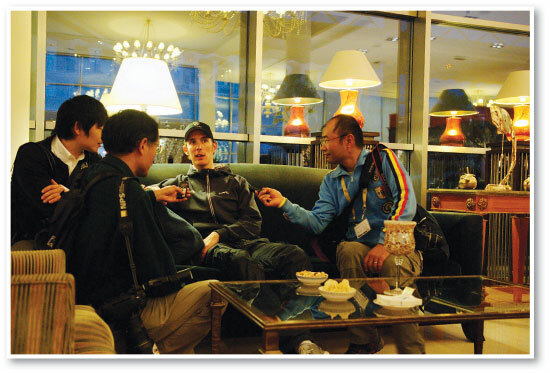 We weren’t scheduled to hit the road with the team until the day after we arrived, so our first encounter with the riders was an informal chat in the hotel bar. It had the potential to feel a bit awkward for some of the riders, as they’d all made the effort to come down from the comfort of their rooms, but of course all the media attention was focused on three riders only – the Schleck brothers and Cancellara. Credit where credit is due: it was these guys that were the first to appear, and the last to leave, and in the face of a tough grilling they were the epitome of professionalism. The following morning we were told, absolutely, not to be late. The team would not wait, and there was only going to be one chance. Of course we ended up waiting around for nearly an hour while all the usual pre-ride faff took place. Then there was a beautifully ironic chain dropping moment for Andy Schleck as he climbed the short incline out of the basement car park. To the relief of some of Shimano’s top boffs over from Osaka, Japan, he was able to make light of the situation. Out on the road some of our media brethren seemed to have let their over-excitement turn their brains to mush. More than a few times we watched on aghast as a press rider turning backwards while riding up the outside of the group, to get a close-up shot of a rider, veered over the white line and almost into oncoming traffic. To my amusement I overheard Frank Schleck tell one Japanese journo: “If you crash us, it’s very expensive”. I chose to stay towards the back, and keep a low profile. While we didn’t really get much from the experience in terms of seeing the riders train (we were ushered to turn off after an hour or so, before the ‘training proper’ began), it was a good insight into what top professional riders need to learn to expect and cope with. Being six foot and 65kg I’m usually the one bearing the brunt of the ‘stick legs’ jokes, and rarely have I ever felt like I could do with shedding some weight, but riding among some of these guys I felt like a proper porker. The Schlecks are one thing, both brothers look pretty skeletal, but Brice Feillu, unsurprisingly one of the team’s climbers, looked even more emaciated. Where does all that pedalling power come from? As my dear ol’ dad used to say, I’ve seen more meat on a butcher’s pencil. These guys are the ‘size zeroes’ of the cycling world for sure.